In honor of the summer Olympics in London, I decided to do a little research to find out what England's national dish is. Well, there seems to be a lot of different opinions about this subject. Many people think of a Sunday Roast Beef with Yorkshire Pudding as the national dish. Others think of Fish and Chips or Bangers and Mash (which is sausages and mashed potatoes). A survey in the United Kingdom concluded that Chicken Tikka Masala is the country's most popular restaurant dish, claiming it as one in every seven curries sold in the UK. The cross-cultural popularity of the dish in the UK led former Foreign Secretary Robin Cook to proclaim it as "a true British national dish". So there you have it. 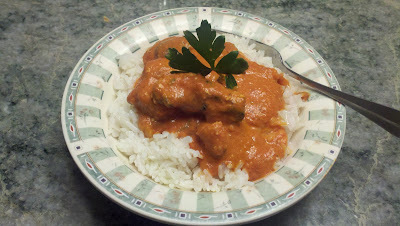 For me, it's still definitely an Indian dish (which is where the dish originated), but who am I to argue? I guess it really doesn't matter. The bottom line is that it's easy and delicious! Everyone LOVED it when I made it for my family's Opening Ceremonies party at my Jeanie's house. SO delicious!! This recipe is from Aarti Sequeira. It's simple and quick, warm and comforting and you should definitely try it! Cooked rice, warm naan bread or crusty bread. In large bowl, mix the yogurt, ginger, garlic, 1 teaspoon salt, and 1/2 teaspoon black pepper. Poke chicken with a fork, then add to marinade. Fold to cover and marinate at least 30 minutes, at most refrigerated overnight. Place a large skillet over medium heat, and add the butter and olive oil. When butter has melted, add the garlic, ginger, and serrano pepper. Saute until lightly browned around the edges. Add the tomato paste and cook until the tomato has darkened in color, about 3 minutes. Add the paprika and garam masala, and saute for about 1 minute. Add the tomatoes, salt, and water. Bring to a boil, then turn down the heat to a simmer, and cover. Cook for 20 minutes. Take the pan off the fire, and allow the sauce to cool for 5 minutes. Meanwhile, fire up your broiler, and cover your broiler pan in foil. Pull the chicken thigh chunks out of the marinade and place on the sheet. Place under the broiler, and cook about 7 minutes on each side, until charred and cooked through. Cook's Note: Don't worry if the chicken is still a little uncooked, but very charred on the outside; you can finish cooking the chicken in the sauce. Pour sauce into a blender or food processor, and process until smooth. Pour back into the pan, and bring back up to a boil. Add the chicken and fenugreek leaves, if using. Reduce heat to a simmer, and cook, covered, for about 10 minutes. Add cream and stir through. Garnish with minced fresh cilantro if you like, and serve over rice, with naan or a crusty piece of bread! It seems to me that people either LOVE cilantro or they hate it. (I've heard many people say that, to them, it tastes like soap! Crazy, huh?) For me, I like it, but a little goes a long way. If you're not a fan, just substitute fresh parsley, or simply omit it entirely. I didn't have fresh tomatoes on hand, so I just used canned crushed tomatoes. It worked beautifully! If you don't want to broil the chicken, you can easily grill it on your outside grill. Just make sure you get a nice black char on it. Instead of transferring everything to a blender or food processor, I just used an immersion blender, and pureed the sauce right in the pot. It made life so much easier!!! If you'd like to add some heat, then by all means, make it as hot as you dare! Just add some diced chilis, as much as you like!